The Piha R&R has a proud history of promoting the wellbeing, environment and development of the Piha community since 1938. We provide a forum within which members can identify, discuss and deal with local issues and concerns, and provide a unified voice to represent those issues and concerns with the Auckland Council. We maintain links with other groups and relevant organisations in Waitakere to make sure our voices are heard. We own and manage the Piha Post Centre and we own the Library building and support the Piha Community Library Trust. We use it to ensure we can represent Piha and Piha people’s needs. Our costs include printing costs, legal costs, accounting costs, venue hire, website and mailing costs to name a few. 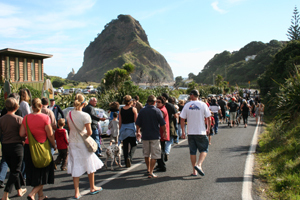 The Rules of the Piha Ratepayers and Residents Association, Incorportated, can be SEEN HERE. An Annual General Meeting is held every year (within 3 months of the end of the financial year). Committee members are elected by members of the Association at this meeting. Download a Committee Nomination Form here. Special meetings are then called on an issue by issue basis. Monthly meetings are at Barnett Hall, North Piha at 7:30pm on the first Friday of each month. Members are welcome to attend or speak at the open forum to raise issues.